There wasn’t much to see in the way of mainstream NFC developments at the 2009 Consumer Electronics Show — but some interesting potentially competitive technologies and enabling solutions made the massive Las Vegas event worth casting an eye over. Microsoft Tag is a new, colour 2D barcode solution that uses a technique called High Capacity Color Barcodes (HCCBs), developed in-house by Microsoft Research. Unlike existing 2D barcodes — such as the QR Code — that use square pixels, HCCB uses tessellated triangles printed in four colours. The new Microsoft Tags also don’t store any data. Like the simplest NFC RFID tags, they store a unique ID which is used as a key to download related information and/or instructions from Microsoft’s servers. Sony caused quite a stir at last year’s CES with the launch of its high speed TransferJet technology. This year, Toshiba was demonstrating its first TransferJet-enabled products. Unlike Bluetooth, TransferJet needs no passcodes and no pairing and it operates at over 100 times the speed — but only over a distance of three centimetres. According to PC World, “Toshiba’s demonstration included a laptop with the technology embedded in its palm rest, and embedded into a mobile internet device from Toshiba Japan. Take the camera, rest it on the palm rest, and it will automatically sync your files over to your laptop’s hard disk drive.” Sony led the creation of the TransferJet Consortium in July 2007 and members now include Sony, Canon, Eastman Kodak, Hitachi, Victor/JVC, KDDI, Kenwood, Matsushita, Panasonic, Nikon, Olympus, Pioneer, Samsung, Seiko Epson, Sony Ericsson and Toshiba. Cambridge Consultants has launched CatchNet, a Bluetooth 2.1+EDR based low cost, low power technology designed to internet-enable single purpose devices and allow two-way interaction between the user and an online application. CatchNet is compatible with NFC, GPS, Bluetooth, WiFi, Zigbee, GPS, VoIP, environmental and other sensors such as accelerometers and, says the company, is designed to help move us one step closer to the ‘internet of things’. Concepts being demonstrated include WhichWay, a key-fob style screenless concept product for commuters that connects to the internet via Bluetooth and a mobile phone’s 3G or GPRS link and alerts drivers to congestion, allowing them to delay their normal departure or to take an alternative route. 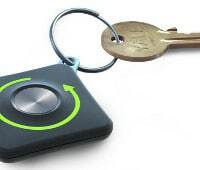 NXP was showing the combined car key and payments device it has developed with BMW, first announced in October 2008. 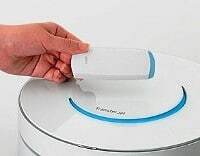 The prototype uses NFC to deliver contactless payment, personalized access control and transport ticketing applications and is powered by NXP’s SmartMX security chip. “The prototype — for the first time — allows drivers to perform quick, secure and convenient electronic payments with a car key, creating exciting new usage scenarios for future consumers,” says NXP. 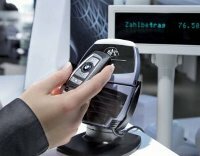 Adding a personalised credit card function to the car key, says BMW, opens the door to a wealth of other mobility scenarios. • Did you demonstrate NFC at the CES? Or are you working on the use of NFC in consumer electronics? Let us know by leaving a comment or send an email to news@nearfieldworld.com. We’d love to hear from you! Will 2009 be the year of NFC?